Remy Chu Jr. is the inpatient clinical manager at Rancho Los Amigos National Rehabilitation Center where he manages approximately 30 clinical staff members and oversees the occupational therapy inpatient operations for the following services: Stroke and Neurorehabilitation; Adult Brain Injury; Spinal Cord Injury; Pressure Ulcer Management; and Pediatrics. He has more than 15 years of clinical experience, most notably in stroke, adult brain injury and neurological rehabilitation. He also serves as the program manager of the Tyler A. Dykes Center for Robotic Rehabilitation at Rancho Los Amigos National Rehabilitation Center. Mr. Chu is regularly consulting, instructing and lecturing nationally on the topics of upper extremity spasticity management, shoulder care, upper extremity motor control, neuromuscular electrical stimulation and fall prevention. In addition to clinical and educational settings, he is also actively involved in research on topics including transcranial magnetic stimulation, microstimulators, stem cells, various pharmacological interventions in rehabilitation and robotic interventions in therapy. Mr. Chu’s skills combine traditional approaches as well as new evidence-based interventions, including the incorporation of transcranial magnetic stimulation and robotic therapy in the rehabilitation of individuals with physical and cognitive disabilities. 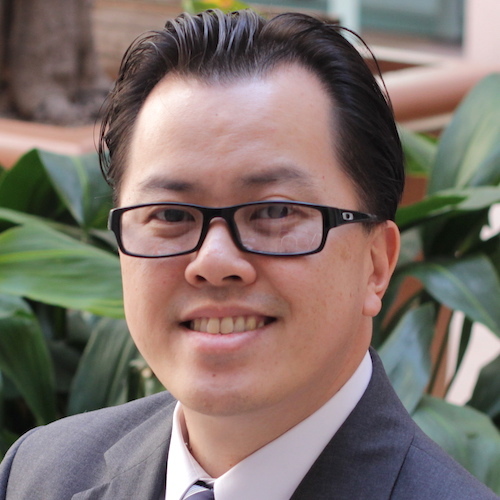 Mr. Chu has received advanced practice approval by the California Board of Occupational Therapy in the following areas: Hand Therapy; Physical Agent Modalities; and Swallowing, Assessment, Evaluation or Intervention. He is also certified in Neuro-IFRAH with formal recognition as a Certified Neuro-IFRAH Instructor. Introduction. Intractable epilepsy responds to surgical ablation of the seizure focus. When one hemisphere of the brain is diffusely affected, as is the case in some children with perinatal stroke, hemimegalencephaly, multilobar cortical dysplasia, Rasmussen encephalitis, and Sturge-Weber syndrome, hemispherectomy may be indicated. Although the procedure improves seizure control, consequences of the procedure include greater sensorimotor deficits, visual, language and behavioral impairments. Few studies have looked into the process of recovery and the efficacy of rehabilitation methods. Task-oriented locomotor rehabilitation has been shown to lead to functional sensorimotor cortex reorganization in the contralateral hemisphere with subjective improvements in behavior. Other studies have shown that motor skill learning is associated with structural brain plasticity, and that practice time and performance modulate the extent of structural brain changes evoked by long term training. This study aims to investigate the efficacy of a task-oriented rehabilitation program for hemispherectomy patients by examining changes in cortical thickness. Methods. This study included 5 hemispherectomy patients (average age 11.2 years; all female) that were enrolled in a high-intensity task-oriented robotic rehabilitation program for two weeks. T1-weighted MRI data was acquired immediately before and after the 2 week long program using a 1.5 T Signa GE scanner at the Rancho Los Amigos National Rehabilitation Center. Each of the subjects had varying amounts of the right hemisphere removed during surgery. Because existing standard image analysis software tools do not adequately handle data with a missing hemisphere, we mirrored the intact left hemisphere. Within-subject analyses were conducted using FSL's SIENA, and group differences were calculated using FreeSurfer. The artificial data from the mirrored left hemisphere was not studied. Results. Motor improvements were shown in 4 of the 5 patients with improvements in the Fugl-Meyer score (average increase 2.5 ± 2.1 SD). Single subject analyses demonstrated an increase in the gray matter volume of primary motor cortex in the non-affected hemisphere in 3 of the 5 subjects (cluster size = 20 voxels). Group analyses in FreeSurfer showed a cluster increase in gray matter in the Supplementary Motor Area. Conclusions. Hemispherectomy is often successful at treating severe cases of epilepsy, however the loss of a cerebral hemisphere typically results in severe motor deficits. Only one previous study has investigated correlation between motor training and neural changes, however there was no significant behavioral motor improvement. This study was able to show an increase in cortical thickness associated with an improvement in behavioral task performance after just two weeks of task oriented training. Objective. To evaluate the feasibility and efficacy of intensive robot-assisted therapy for improving long-term motor deficits after cerebral hemispherectomy. Background. Few studies exist on rehabilitation methods for hemiparesis in chronic-phase cerebral hemispherectomy patients. Effective regimens are needed as they face significant disabilities. Robot-assisted rehabilitative devices are designed to deliver high-intensity, high-repetition therapy with continuous interactive responses. Design/Methods. Seven post-hemispherectomy patients (11.2±0.9 years; age at time of first surgery 0.25-9 years; all subjects >1 year from last surgery) received 8 days of robot-assisted rehabilitation, three hours/day (1 hour each of Hocoma Lokomat driven gait orthosis on treadmill, InMotion ANKLE for foot dorsiflexion/plantarflexion and InMotion ARM for upper extremity horizontal movements) over 2 weeks. Outcome measures were assessed pre- and post-intervention on the hemiparetic side using Fugl-Meyer Assessment, Wolf Motor Function Test functional ability (WFMT-FAS) and time (WFMT-TIME), Chedoke Arm and Hand Activity Inventory (CAHAI), Six-Minute Walk Test (6MWT), and 10 Meter Walk Test (10MWT). Results. Significant improvements were seen in Fugl-Meyer (P=0.02), WFMT-FAS (P=0.005), WFMT-TIME (P<0.001), 6MWT distance (P=0.04) and 6MWT speed (P<0.05). No significant improvement was seen in CAHAI or 10MWT. Conclusions. Intensive robot-assisted therapy improved upper extremity motor functional ability and gait endurance in post-hemispherectomy children. A short-duration, high-intensity regimen of robot-assisted therapy is a feasible and efficacious rehabilitation method in these children. Improvements were seen despite participants being well out of the acute recovery period, supporting the idea of continuing neuroplasticity in the remaining cerebral cortex. The CAHAI may not be sensitive enough to capture the participants' changes, and the number of therapy sessions may not be enough to effect a change in top walking speed. Whether greater improvements would be seen with more prolonged therapy, or with a less-intense regimen over a greater period of time, remains to be tested.